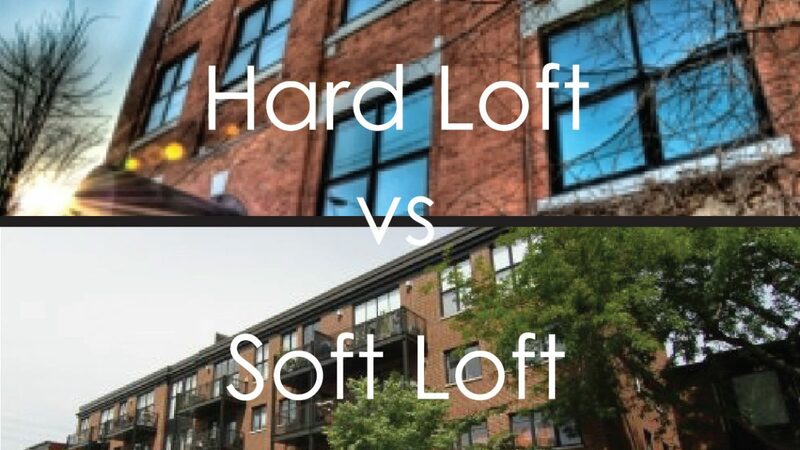 Do you know the difference between a hard loft and a soft loft? An authentic Hard Loft is a rare beast. Lofts in Ottawa are in short supply due to the nature of their origin. In order to fit this category, a former industrial or commercial use space must be converted into a residential living space. Out of this formula, some common elements arise. Old, often exposed brick, visible mechanical elements of the building such as pipes and beams, large windows and vaulted ceilings. The latter is the element from which a loft derives its name. A lofted ceiling that allows a living space to feel much larger than the square footage of the floor plan. Ceiling heights from 11 to16 ft are common. Soft Lofts are new builds designed to offer the space and style of a hard loft. The demand for hard lofts far exceeds availability and the costs associated with these one of a kind spaces, place them out of reach for many buyers. Here is where the Soft Loft comes to life. Builders, eager to fill the demand for open concept spaces, adopted the term loft and applied it to units which outside of the conversion elements, fit the design and style criteria of a loft. More commonly found in low and mid-rise buildings, upper floors in high rise buildings may also have units that have been given a Soft Loft treatment. The popularity of the Soft Loft is growing along with the demand for higher ceilings, open floor plans and unique design elements. Luckily supply is high since the units are created with new builds, there is no limit on how many can hit a given market. However, due to the low supply Hard lofts are more likely to retain their value over time and suffer less vulnerability to market shifts. One of the biggest bonuses of Soft Lofts is their inclusion in building projects that compete for best amenities. New build condos have to offer a wide and exciting range of amenities to attract potential buyers. Finding a soft loft in a building that also has the concierge, party rooms, pools, full-scale gym and rooftop BBQ’s is not uncommon. They are also not restricted by an existing structure. A soft loft can be built into any design or building, offering more options for style and layout. Developers will sometimes use the mixing of these elements. They design multiple building complexes, combining Condo units, Soft Lofts and Townhomes into a single project. Studio Argyle Condo Ottawa was built in 2000 by Domicile Developments. This unique low rise building contains 40 units spread out on 4 storeys. Studio Argyle Condo Ottawa is an eye-catching building with its prominent red brick and cream accents. Located in between Ottawa’s popular and well-known streets, Elgin Street and Bank Street, this building is in the heart of Ottawa’s Centretown. Enjoy a Sunday stroll down the Rideau Canal, or go afternoon shopping in the Glebe. Studio Argyle Condo Ottawa allows you easy access to Ottawa’s economic and social neighbourhoods. Perfect for the artsy modern student, professional or retiree these units are unique and stand out with their distinctive architecture. The lofts here are dramatic, pipe and/or brick exposed units with a feel you won’t find anywhere in Ottawa. Fireplaces in living areas, expansive outdoor terraces and gas in the kitchen and balconies make this building truly unique. Studio Argyle Condo Ottawa features a beautiful lobby with accent art pieces, elevator, underground and surfaced parking and private storage lockers. Wallis House Condo Ottawa is a classic heritage building unlike no other. Constructed in 1983 this building was originally one of Ottawa’s first modern hospitals. After the hospital closed in 1924 the building served as a seminary, barracks, veteran housing, an armoury and during the Second World War Canadian Military Soldiers occupied the building. In 1990, Wallis House Condo Ottawa was officially designated a Heritage Building by the City of Ottawa. Following this designation, Smallwood of Andrex Holdings in partnership with Wilberfoss Inc and Domicile acquired the property and converted the interior of the building to the current 46 authentic loft condominiums that were designed keeping in mind the Heritage significance of this amazing building. Cathedral ceilings, wide hallways, and soaring windows characterize each unit, which boast a New York-style loft feeling. Beautifully upgraded, 1-2 bedroom units feature exposed brick walls, exposed ducts, fireplaces, hardwood flooring, and open concept living, with many units featuring 2 storeys for trendy loft living. Building amenities include an exercise center, security, and a rooftop terrace. Located blocks from walking paths, parks and the Rideau River, yet is still within walking distance of everything downtown has to offer. Warehouse Lofts Condo Ottawa prior to it’s condo conversion, was a factory warehouse creating a variety of products of the years. In 2000 the building was converted into a condominium by retired Ottawa real estate lawyer, Craig Callen Jones. The condominium conversion project consisted of creating 30 open-concept unique lofts within the preexisting structure. The lofts feature inviting and well thought-out design accented by warm hardwood floors, high quality and creative built-ins, exposed brick walls, wood beams, and high cathedral ceilings! The beautiful timber beams used in the conversion project are a stand out in this building, setting it apart from other loft conversions in the city. Many units also feature exposed duct work, fire places, and beautiful staircases allowing for 2 storeys of authentic loft living. Enjoy living in Little Italy, steps away from some of Ottawa’s greatest restaurants, pubs and shops! Welcome to 150 Caroline Av Condo Ottawa, in the heart of Wellington Village. Built in 2004 by Routeburn this low rise building contains 40 units. They come in a variety of layouts containing 1 or 2 bedrooms. The units in this building offer a lofty feel with 9″ high ceilings & floor to ceiling windows, some even include natural gas or electric fireplaces. The Penthouse condos in this building boast 2 storeys for added space with 10″ high ceilings on the top level. Every unit contains 1 private balcony, many feature an additional private terrace, that features beautiful views of Ottawa and the Gatineau Hills. Amenities at 150 Caroline Av Condo Ottawa include elevators, fob security access at all exterior building doors, underground parking, visitors parking and storage lockers. There is even a Bridgehead Cafe on the main level of this great building, convenient for morning or afternoon coffees. Enjoy being in the heart of Wellington Village, shops, cafes and restaurants at your doorstep! Lofts at Tribeca Condo Ottawa is one of Claridge Homes newest Developments. Located at 197 Lisgar St, Lofts at Tribeca Condo Ottawa is right in the heart of Centretown. Lofts at Tribeca Condo Ottawa have 1-2 bedroom lofts available to purchase, ranging in size from 900 sq ft to 1,435 sq ft. With an average price of $519/sq ft, you don’t need to give up quality or style for affordability. These modern industrial style lofts come with designer finishing packages and custom kitchens. The building holds 20 units spread over 2 stories. On the south side of the building, there is a landscaped terrace to enjoy the view of our nation’s capital. Residents of Lofts at Tribeca Condo Ottawa have access to all of the amenities located within Tribeca Condo Ottawa & Tribeca East Condo Ottawa. These buildings offer a recreational and fitness facility, including a gym, change rooms and swimming pool with kids splash pad. A community party room as well as separate meeting rooms and board rooms and 2 guest suites are also available to residents and their guests. There is also a fabulous rooftop terrace offering amazing views of Parliament Hill. The Dwell Condo Ottawa , built by Domicile in 2007, is a great urban loft building containing 35 units located in Centretown. Although located on a quiet, tree-lined street, this building is just steps from the hustle and bustle of Ottawa’s shops, restaurants, and bars. The units are characterized by high 12 ft ceilings, hardwood floors, gas fireplaces, large windows, central air, and balconies. A unique feature of this building is the units offer gas hook ups on private balconies for residents to use for their own personal bbqs. Underground parking, storage lockers, elevators, a bike room, and secure entrances are great features that this building offers. The Dwell Condo Ottawa is ideal, perfect for either relaxing or entertaining.